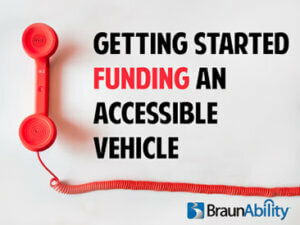 You have a need: funding anaccessible vehicle.And you have questions:how do you even get started with such a large task? Even more so: how do I get chosen out of a list of applicants? Tamara Simmons, author of "The Funding Guide for Children with Disabilities," says the first step should always be research. "You need to get a cost from the service or equipment provider...It is common for a funding source to require a discount, so when you call for the quote, let the store know you may be purchasing the product through a funder and ask if they will offer a discount." Calling a dealer or our Customer Experience Group(800-488-0359) will allow you to find pricing for exactly the vehicle or lift you are looking for. You'll also want to be sure your nearby dealer has technicians trained in the repair or maintenance of the product in question. Medical History Sheet including diagnostic codes, list of surgeries, etc. Not all grants or funds will need this information, but some will. This might come as a surprise to some, but it's important to secure a denial letter from your insurance company. Most often, the assistive technology in question will be denied by your insurance company. (If not, great! You are on the road to getting the monetary assistance you need.) It's likely you'll need a denial letter to apply to certain funders, and the process to get it can take a while. Calling ahead and explaining what you need may speed up the process. Be specific in your ask for assistance. Don't just say that an accessible vehicle will help you get around easier: that's true for everyone. Explain your challenges and interests and illustrate how this specific vehicle will meet them. Now you are ready to research and apply for grants and funding. There are several kinds of grants: some are available to anyone, some are specific to a region, and others are specific to the type of disability, your age, or whether you've ever served the U.S. Armed Forces. BraunAbility has an extensive list here where you can search by category to find applicable grants and funding anaccessible vehiclepurchase. Also be sure to check out NMEDA's listing of funding sources. Everyone has a way to approach fundraising that feels right for them. But for those just starting out, give these starter steps a try! If you don't see a certain funding source on our list, contact us at suggestions@braunability.com and let us know what it is about so that we can add it to our listing.